Our air conditioner is back on line … sorta. We have to flip the breaker to turn off the fan. The thermostat isn’t working right, but at least we can turn off the compressor at the thermostat. We have to go outside to turn off the fan. It’s been over 100F/38C, cooling to the upper 80s/lower 30s at night. So the A/C really helps sleeping. My serger is back from the shop again. I really missed it. Having it and having the A/C back (so I could use the iron and my sewing lights) made me want to sew again. I worked on Kwik Sew 2565 with a french dart. I sewed the darts on my third attemp at Simplicity 5098. (This time for sure!) I edge finished Kwik Sew 2743. It is now possible to use the serger with Pulguito in the room. He no longer tries to pull the cut off bit of fabric out from under the knife. He likes to grab the wheel while it’s going around, and he pulled the right most cone of thread off it’s stand, but he put it back as soon as he realized I was watching. It was cute because he knew he wasn’t supposed to be doing that. The guilt ridden look on his face was priceless. Chunguita sorted my pins in my pin cushion. They are now sorted by size, pin head type (none, ball, flower), and color. I think I will get out her button collection and work with her on sorting those. She hasn’t been ready to do that until now (4 years 8 months). Pulguito woke up with a 102F fever at 2 am. He had been warm when I put him to sleep, but I was hoping that it was just that he was warm. I gave him some ibuprofen, and he went back to sleep. He woke 2 more times; being a mom is so much fun. He was still warm this morning. I left him at home with Robert. Pulguito’s big accomplishment for the day was to take all the toilet paper off the roll, stuff it in the toilet, and try to flush. You know what happened. Of course, this is why I became a mother; my life wasn’t challenging enough. After this, he bit Chunguita hard enough to break the skin. Robert went fishing today, so I was home alone with the kids. We went to Target, the grocery store, came home and played, ate lunch, and went to the Pleasanton pool with the Chunguita’s best friend, Alyson. Chunguita and Alyson played with Alyson’s mom, so I was able to play with Pulguito. Once he realized that he could stand up in the pool, he was all over the place. Chunguita showed off her swimming skills to Alyson and her mom. While Pulguito was napping, Chunguita helped me sew. She likes to sort the pins in the pin cushion and hand them to me when I need one. Yesterday, we went to Marine World. On the way out, we stopped at Starbucks to get coffee. Robert had been watching Pulguito all morning, so I assumed he had fed him, but he hadn’t. I bought Pulguito a crossont at Starbucks; Pulguito really liked it. I offered Chunguita half, but she said she didn’t like it. For the rest of the trip to MarineWorld, Chunguita complained, whined, and cried that she was hungry. This was Pulguito’s first visit and Chunguita’s second. It was so hot, like 100F. School had started earlier this week, so the park wasn’t very crowded. We had forgot to bring caps for the kids, so we had to buy them some. Chunguita picked out a pink on (of course) with sparkles, and Pulguito got one in red and blue with Baby Tasmanian Devil on it. For lunch, the kids had hotdogs and french fries. Pulguito didn’t know what to do with his hotdog in the bun, so I took it out and bit it into bitsized pieces for him. Chunguita ate very well. We saw the killer whale show. I had forgotten how much smaller Marine World is compared to Sea World. The shows don’t compare at all. They only have one orca at Marine World, Shouka. She’s been there for 5 months, and she’s 11 years old, pretty young. She’s not really into performing, and she’s insecure about everything. So the show was not very good, but it was interesting to see that not all orcas are into performance. It was kinda funny when they sent her out to splash the audience. Instead of turning upside down and splashing with her tail, she spyhopped the audience. The trainer had to go over to the spot and tell he what to do. The best part of the orca experience was the preview area before the show. Shouka likes to come to the window and see the people looking at her. So it feels like you are really close to her. Pulguito loved it, and Chunguita was a little scared. After the killer whale show, we headed out to the waterski show. There was no shade, but both kids liked this show the best. (sigh) Pulguito liked it so much that we had to move up to the front row in the center. After the boats went by, he’s baby-sign and verbally ask for more. We visited the walruses. There are 4, 3 females and one male. This is the first time I’ve ever seen a walrus moving. In all the other exhibits, they just sit there. The docent thought it might be because they were hot. So this was another really cool exhibit. They would come swimming right up to the window and flip. Sometimes they would hang out and watch us. The male spyhopped and stopped fully extended vertically, and we were able to appreciate how long he was. Pulguito loved it. He was right up against the glass. Chunguita was a little afraid at first, but after she saw Pulguito, she went up to the glass. Next to the walruses, they have a ride area for little kids. The water ride is 2 towers with water spilling over them. Chunguita wouldn’t go on, so Robert and I took turns taking Pulguito on. It was so cooling. We went on a submarine ride that went around a vertical circle, so you “lose you stomach”. Pulguito clutched at me the entire time, but as soon as the ride stopped, he was saying more, more, more! We spent over an hour in this area. The kids really liked it. After that we headed over to the animal nursery because someone had told us that they had the tiger cubs on display for the first time since they’d been born. On the way there, we stopped at the butterfly exhibit. It wasn’t as good at the one in Canada at Nigara Falls, except that they had a really great koi pond with fish that looked to be 75-100 years old. Pulguito loved it and spent most of his time watching the fish. It was too hot and humid in there for me, so I had to leave early. Then we stopped at the aviary and bought some necter for the birds. I had Robert give the birds all the necter so that I could take pictures. Besides, I’m afraid of the birds, and I really don’t want them landing on me. We finally got to the tiger cubs, after a stop to see the giraffes, lions, and bengal tigers. The tiger cubs were only 20 days old and very, very cute. They had a cheetah, there, too, but she wasn’t cooperating and had her back to us the entire time. After a stop at the prairie dog exhibit, we had Subway sandwiches for dinner then raced to see the dolphin show. Again, it wasn’t much of a show. But there was a marked difference in the bottlenose dolphins’ desire to perform and the orca’s. The dolphins were having fun. Pulguito was so tired that he couldn’t sit still. I know that sounds like a contradiction, but his attention just couldn’t be focussed on anything, so he was constantly moving. We had to move up to the back of the show, to a spot where it was safe for him to climb and move around. When we got back to the car, Pulguito was asleep instantly. Chunguita fell asleep about 15 minutes later. The drive home only took 45 minutes, no traffic. My daughter was home sick yesterday, so I stayed home with her. I was able to work with my Artista software. I have downloaded a lot of the freebie designs on the internet, but I hadn’t done anything with them except maybe convert them to .ART format. After digitizing that lily, I thought I would take a look at one of the designs that I downloaded. The eagle to the right is from Buzz Tools. It was terrible. There were jump stitches all over the place, travel stitches, in a terrible order. So I decided I would fix it. 2 hours later, I finally figured out how to delete the first object. This project started with one stitch in the center of the design, followed by a jump stitch to the first filled object. I don’t see any need for a center starting point. I persevered, and after about 8 hours, I finally had something to send to my embroidery machine. Now to stitch it out. Here’s the first sample digitized using magic wand in the Artista embroidery software. The fabric is a cotton/lycra twill. I used Sulky Totally Stable which is not stiff enough to manage the stretch in the fabric. 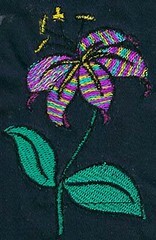 The green and varigated threads are Superior embroidery thread. The pink is Coats & Clark rayon embroidery thread, and the black and yellow are Isacord. The navy fabric makes it tough to see the details in the image, but this is a better embroidery than the first one. I reoriented almost all of the fills. The one petal that looks different is 90 degrees off; I’m not sure what happened. I like the way the varigated thread came out in that petal better than the others. Overall, I don’t care for the varigated thread in this sample. I also learned that you have to specify jump stitches. See the line in the lower righthand leaf? The fabric is a lightweight cotton. I used Sulky Totally Stable which I don’t like and won’t be buying again. 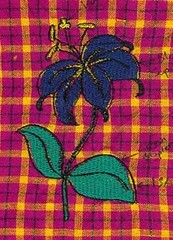 The green/leaves and the blue/petals are Superior embroidery thread. The navy/underpetal is Coats & Clark polyester embroidery thread. The yellow and black/outline are Isacord. I think it looks crappy because of the autodigitizing. However, I have not had great results with the Totally Stable. I used the AmazingMiniBox (AMB) to transfer the design from the computer to a card. They don’t tell you on the box that the AMB can write .ART format, but it cannot read .ART format from the computer. So I saved the design as a .PES and had to have the AMB convert that to .ART. I’m not sure that I would have bought AMB if I had known that ahead of time. As it is, I’m going to have to buy a card and cardwriter from Bernina, and that is going to be big bucks.